Children's Hospital can now better predict when pediatric patients need a transfer to intensive care with the pRI tool. Children's Hospital of Pittsburgh of UPMC was the first pediatric hospital in the U.S. to achieve Stage 7 recognition from HIMSS. Leveraging data analytics has been a significant initiative and commitment of time, said Srinivasan Suresh, MD, the hospital's chief medical information officer. "We don't just see it as another tool," he said. "It's not just an IT buzzword; it's about improving care." 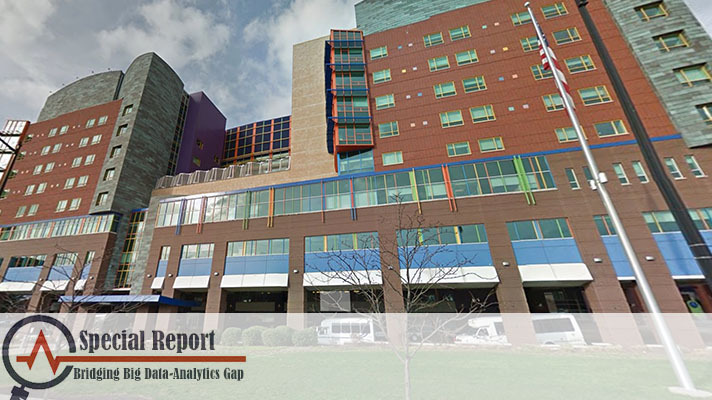 The hospital utilizes multiple advanced analytics tools. One of them is a customized tool based on the Rothman Index, which uses an algorithm to generate an early warning sign indicator. The software pulls data from the Cerner EMR (including nursing assessments, which are textual) and translates it into a 'Rothman score' that ranges from 0-100, presented with graphs that track trends throughout admission. Providers can predict when certain patients may need a transfer to the intensive care unit. According to Suresh, the original model was only effective for adults. So Children's, with help from clinical surveillance vendor PeraHealth, co-developed a model specifically for children, by adjusting the variables based on age-based differences. "The biggest overarching outcome is to eliminate avoidable harm," he said. IT plays a big and meaningful part in improving care outcomes. We apply IT to reduce operational costs, improve system efficiencies, better understand workflow and reduce avoidable readmissions." The team spent the last two years extensively testing the pediatric Rothman Index, or pRI, before it went live in November 2015. Although the lead-up time was long, it was important to ensure the value that the new score would provide to patients and clinicians, Suresh said: "The biggest challenge to implementation is time." The pRI is a dynamic tool that is now available for every acute care patient in the hospital. According to Suresh, another key aspect of a successful go-live is physician buy-in. "It's a critical part of implementation," he said. "I want physicians and nurses to ask me lots of questions. That really helps me to serve their needs better. Learn more at the Healthcare IT News Big Data and Healthcare Analytics Forum in San Francisco, June 14-15, 2016. Register here. "I have a great team," he said. "When dealing with large amounts of data, it is the skill sets of the team members and the teamwork that help generate success." As part of building their analytics platform, Children’s established a separate Data Warehouse team within their IT set-up. This helped to streamline data requests from clinicians and administrators, and also with the data mining projects. "Advanced analytics is an absolute need," said Suresh. "It's an investment in time and resources. Although you may not see results early on, over time it reduces costs, length of stay and morbidity. … It's important to keep focused on the long-term outcomes."